You can use a CSV file to upload changes to the Gradebook. You can upload information for existing assignments, or you can also use a CSV file to create new assignments in the Gradebook. New assignments will automatically be published in your course. If you do not know how to save a file in a CSV format, please check the documentation for the program you are using to create your Gradebook changes (e.g., Excel). If you don't want to create a new CSV file, you can always download the CSV from Canvas, change it, and re-upload the same file and the changes you made will appear in Canvas once you re-upload the CSV file. The Gradebook CSV file downloads complete/incomplete assignments as full or no credit (e.g. for a 10-point assignment, 10 or 0). Scores with full or partial credit upload as a complete assignment; scores with zero upload as an incomplete assignment. 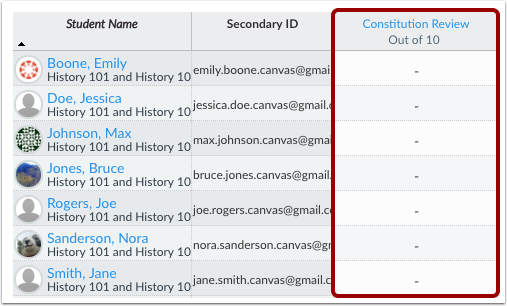 CSV file uploads can create assignments and update grades; they cannot update any other area of the Gradebook, such as assignment status or comments. Letter Grade and GPA Scale assignments do not support any entries that are not part of the assignment's grading scheme. All changes made to non-read-only columns are included in the upload. However, read-only columns are automatically ignored in the upload. When multiple grading periods is enabled, CSV file uploads cannot create new assignments. Currently new assignments must be created in the Canvas interface. Additionally, CSV files are verified against grading period close dates; grades cannot be changed for any assignment in a closed grading period. An upload will not recognize assignments named Current Score, Current Points, Final Score, Final Points, or Final Grade. To upload changes to the Gradebook with student or assignment names containing special characters, please ensure the file is saved as a UTF-8 CSV. For new files, save the file as Grades-Course_Name.csv. Click the Choose File or Browse button (depending on your browser). Locate the CSV file  then click the Open button . If you add a new column to the CSV file and then upload the file, Canvas will ask you what you want to do with the new column. In the drop-down menu, choose the A new assignment option . Then assign the number of points possible . Click the Continue button . Note: When multiple grading periods is enabled, CSV file uploads cannot create new assignments. Review the changes made to your Gradebook . If you upload assignments with no grade changes, they will be hidden from the upload. Click the Save Changes button . View the updated data in the Gradebook. 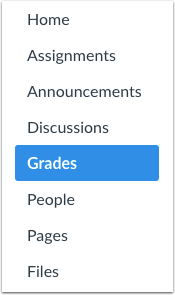 Previous Topic:How do I export grades from the Gradebook? Next Topic:How do I post final grades as a moderator for a moderated assignment with one grader? Table of Contents > Grades > How do I upload changes to the Gradebook? Re: Using download/upload to add scores to existing gradebook?